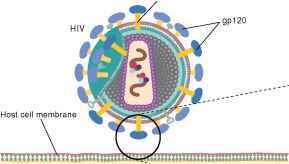 Figure 29.3 Human Immunodeficiency Virus, Type 1 (HIV-1) (a) Diagrammatic representation of the virus showing important antigens. (b) Map of the HIV-1 genome showing its nine genes and flanking long terminal repeats (LTRs).The LTRs contain regulatory sequences recognized by the host cell. (c) HIV-1 gene products.The accessory gene products are translated into proteins of final size, while gag and pol products must be cleaved by viral protease, and env products by host cell protease.The small arrows indicate the sites of cleavage. There are six additional genes, known as accessory genes, all translated from spliced messenger RNAs. These genes, tat, rev, nef, vif, vpr, and vpu, code for the proteins Tat, Rev, Nef, Vif, Vpr, and Vpu. These gene products and their known or assumed functions are listed in table 29.2. 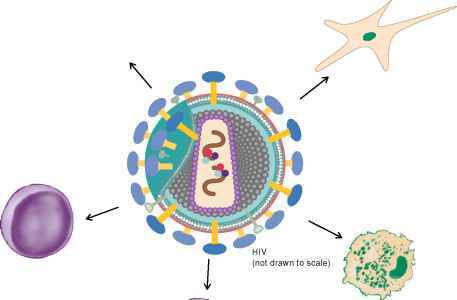 The functions of these HIV accessory genes are exceedingly complex, as they interact in different ways with host cell substances and vary with the type of cell infected. Developing knowledge of their gene products promises to reveal new ways to attack AIDS. Infection of intestinal epithelium and lymphoid tissue probably contributes to chronic diarrhea and weight loss. Infection of several types of brain cells probably contributes to lethargy and HIV dementia. CD4+Th1 inflammatory cells are the principal target of HIV. These cells are normally responsible for macrophage activation and cell-mediated immunity through CD8 cytotoxic cell activation. CD4+ macrophages, dendritic and other antigen-presenting cells harbor HIV but are not usually killed by it. The cells are a continuing source of the virus and can carry it into the brain. CD4+ Th2 helper cells normally control antibody production by B cells. 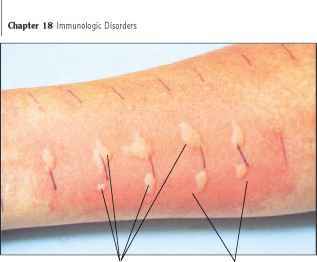 744 Chapter 29 HIV Disease and Complications of Immunodeficiency responsible for the chronic diarrhea and weight loss, and infection of brain cells for HIV dementia. Infected macrophages and other antigen-presenting cells are a continuing source of infectious virus and show impairment of chemotaxis, phagocytosis, and antigen presentation. They and the Th (T-helper) lymphocytes are exceedingly important targets of HIV because of their central role in the body's specific immune response. The cytokines of Th lymphocytes regulate cytotoxic action of Tc cells, immunoglobulin production by B cells, and chemotaxis of antigen-presenting cells such as macrophages.